Last Saturday I came to campus (as usual) to catch up with some work and I found myself immersed in our students’ “Pimp my Barrow” end-of-exam-period celebration. As new comer, I was yet to get acquainted with this event, but I discovered it even has a Wikipedia entry! Groups of students decide on a theme, design and create their fancy dresses as well as make additions to their barrow around their theme. 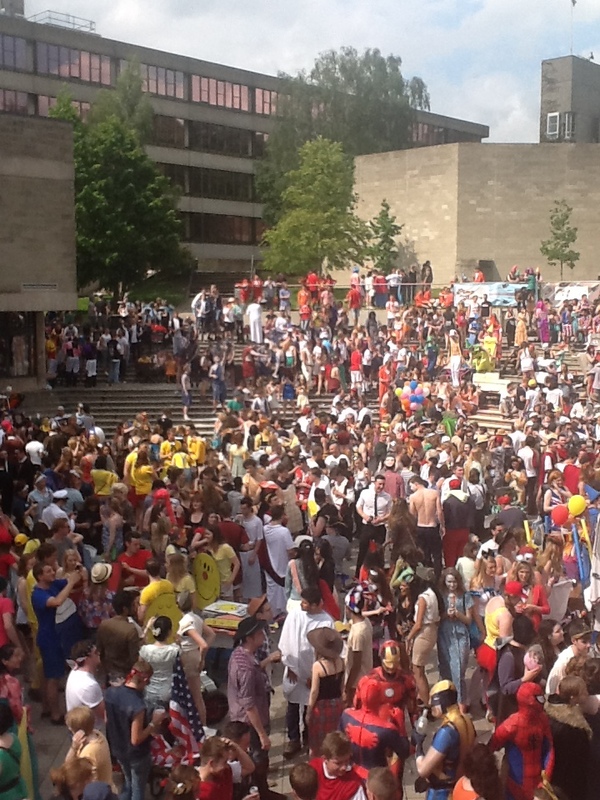 They race from Norwich city centre to UEA, where a big party explodes. After a few hours of banter, they storm back in town to collect money for charity and to continue on with the celebrations. While standing on the balcony overlooking the campus square going insane, I was amazed by the ingenuity of our students, the originality of their costumes, and the wit of some of their ideas. At some point I caught myself shaking my head and thinking (perhaps with a little envy for the fun they were having) that if ever our students applied the same craft, originality, independence and thinking in their studies our job would be so much easier and fun. I must admit, I felt immediately ashamed of that thought…because what came to my mind next is that very often we are the ones to blame. If our students can do extraordinary things with a carton box, a little face paint, and some old charity-shop old clothes, can you imagine what they could do with the right learning tools, academic knowledge, and thinking freedom? if they are so great at pimping their barrows, we should be equally great at pimping our teaching.